Daily exercise is important for children and adults. You can get your daily dose of exercise by installing a roof mount basketball hoop on your garage, shed or even a low roof on your home. 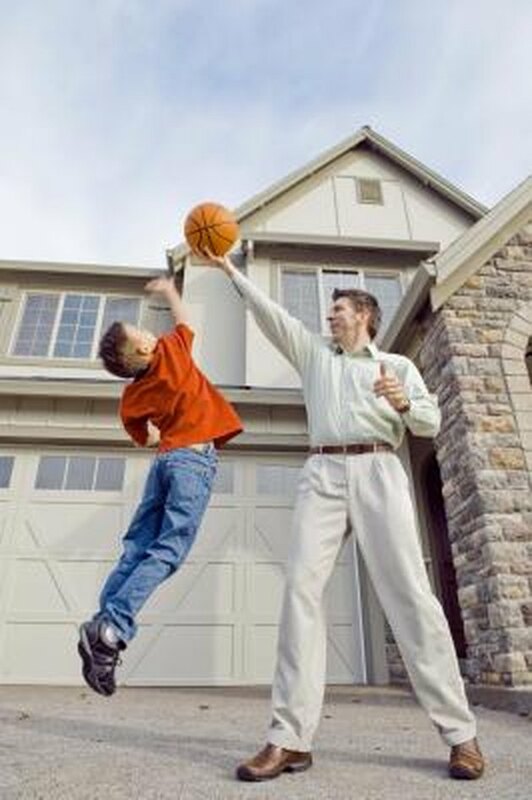 The regulation height for a basketball hoop is 10 feet but the actual height of yours will vary depending on the height of the roof you want to attach the basketball goal to. Basketball is a great way to get exercise. Center a ladder in the middle of your garage, home or shed wall and locate the roof studs in the center of the roof with an electronic stud finder. Drill pilot holes into the marks on the roof with a drill bit approximately ¼ the size of the lag bolts you will use to mount the bracket. Use a hand drill to complete this step. Fill the holes with caulk to prevent water from seeping into the holes and rotting the studs. Place the mounting bracket onto the roof, line up the holes and secure the bracket to the roof with the lag bolts supplied with the mounting bracket and a socket and ratchet. Secure the backboard to the bracket using the supplied bolts and fastening hardware.